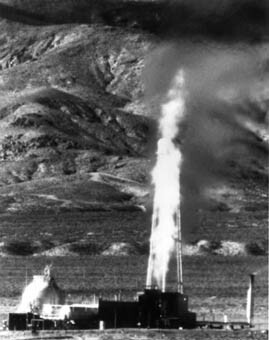 The AEC's nuclear-rocket program could trace its beginnings to December 1953, when the nuclear scientist Robert Bussard published an article on this topic in the classified Journal of Reactor Science and Technology. His paper stirred interest, and led to the initiation of an experimental effort called Project Rover at Los Alamos, New Mexico. Initial work aimed at building a succession of rocket reactors named Kiwi after the flightless bird of New Zealand. The basic approach followed Bussard's proposal, calling for a compact reactor built of graphite, which withstands high temperatures and actually gains strength when heated. Hydrogen, flowing through channels in this reactor core, would receive heat from the reactor and reach temperatures of  several thousand degrees. This gas would then expand and flow through a nozzle, to produce thrust. In November 1962, during a test of a new and promising Kiwi, disaster struck. The analyst James Dewar writes that "paralleling the rapid increase in power was a rapid increase in the frequency of flashes of light from the nozzle. On reaching 500 MW, the flashes were so spectacular and so frequent that the test was terminated and shut-down procedures begun. Quick disassembly confirmed that the flashes of light were reactor parts being ejected from the nozzle. Further disassembly and analysis revealed that over 90 percent of the reactor parts had been broken, mostly at the core's hot end." Other work improved the non-nuclear parts of the rocket. The AEC test facility included a liquid-hydrogen pump that served well during the ground tests, but was unsuitable for flight. During 1965, however, workers assembled a complete nuclear engine that included a hydrogen-cooled nozzle as well as a flight-type turbopump. Tests of this engine began that December and reached full power in March 1966. This was the first operation of a nuclear rocket with major components representative of a flight-rated engine. Subsequent work returned anew to reactor development, emphasizing long-duration tests as well as high power. In December 1967, an experimental version of NERVA carried through a 60-minute endurance run at rated temperature and full power, 3630 degrees Fahrenheit and 1100 MW. In addition to this, Los Alamos was developing a new class of reactors called Phoebus, rated at 5000 MW. A June 1968 test ran for over 30 minutes, with 12 minutes at or above 4000 MW. The rapid pace of advances in Nevada contrasted painfully with the lack of plans in Washington. With NASA having no approved post-Apollo future, it was quite possible to anticipate a time when Aerojet might build a well-tested NERVA, ready for flight, only to find that NASA had no reason to use it. NASA's prospects did not improve during 1968, as the agency launched a new attempt to plan its future. This new planning effort began that February when NASA Administrator Webb named Homer Newell to direct it. 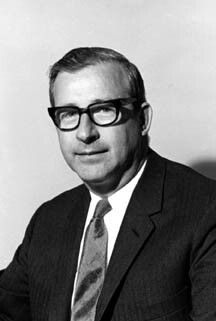 Newell, who had headed the Office of Space Science and Applications, had been promoted to Associate  Administrator in October 1967, giving him agency-wide responsibility. He hoped to prepare proposals that could influence the FY 1970 budget request that would go to the Bureau of the Budget (BoB) late in September. He proceeded to set up 12 working groups, drawing on a broad range of NASA specialists. A Planning Coordination Group (PCG) would direct the working groups' activities; a Planning Steering Group then would choose alternatives and pass recommendations to the Administrator. It is difficult to conceive of any use short of a manned planetary expedition that would require men to operate in orbit for more than 30 days. Most  scientific endeavors that require the collection of data by means of space flight can be accomplished by unmanned systems at considerably less expense than the manned flight systems. Reasons for proceeding other than competition include enhancing the national prestige, advancing the general technology, or simply faith that manned space flight will ultimately return benefits to mankind in ways now unknown and unforeseen. None of these secondary arguments can be quantified and most are difficult to support. "Do not go gentle into that good night," wrote the poet Dylan Thomas, in writing of elderly people facing death. "Rage, rage against the dying of the light." NASA's light was not yet dying, not with the piloted moon landings immediately ahead. But under new leadership, this agency was ready to rage with vigor against the slow demise that seemed to be marked out as its fate. Like a good Navy man, he hit the ground running. Though still recovering from the Apollo fire during that year, NASA was pushing forward in  expectation of meeting President Kennedy's goal of a piloted lunar landing by the end of 1969. The Apollo spacecraft, well along in development, would soon be ready to carry its crew of three. The Saturn V, in flight test, soon would be ready as well. However, a vital element of Apollo, the lunar module, was encountering delays. This spacecraft, with room for two astronauts, was to carry out the actual landing on the moon. The Saturn V was to carry a complete moonship, comprised of both an Apollo spacecraft and a lunar module, with the latter being flight-tested in both Earth and lunar orbits before it could qualify for the demanding task of a lunar landing. Its delay in development, however, raised the prospect that a Saturn V might be ready for launch, with only the Apollo spacecraft qualified for flight as its payload. At the Manned Spacecraft Center in Houston, George Low, head of the Apollo Spacecraft Program Office, was ready to accept this. He recommended that the mission leave the lunar module on the ground, but send the Apollo spacecraft into lunar orbit, allowing its crew to circle the moon repeatedly before breaking out of that orbit to return to earth. In August 1968, Webb and Mueller - both out of the country attending a United Nations conference in Vienna - left Paine in Washington to mind the store. Sam Phillips, the Apollo program director, told him of Low's proposal. Paine, who found the concept exciting, gave it his full support. He then tried to sell it to Webb, as both he and Phillips talked to their Administrator via overseas telephone. Webb was shocked at the audacity of the idea, and yelled, "Are you out of your mind?" They had not even flown a piloted Apollo spacecraft in Earth orbit. In addition to this, Webb viewed the lunar module as a lifeboat that could save the crew of a lunar mission if their Apollo spacecraft were to become disabled.13 Any piloted lunar mission would be dangerous; to fly without a lunar module would make it more so. In turn, the deaths of additional astronauts, in the wake of the Apollo fire, would shake NASA to its foundations. Nevertheless, Webb did not say no; he left the door open. When Paine then strengthened his argument by sending Webb a long cable, Webb grudgingly agreed to consider this proposal, at least for purposes of planning. Events now played into Paine's hands. In September, the Soviet Union carried out an  important lunar mission, Zond 5. This spacecraft looped around the moon, returned to earth, reentered the atmosphere, came down in the Indian Ocean, and was recovered. Two turtles were aboard, and they came back safely. An impressed Webb described this flight as "the most important demonstration of total space capacity up to now by any nation." Zond 5 raised the stakes. All along the goal of Apollo had been to beat Moscow to the moon; yet by sending a cosmonaut in place of the turtles, the Soviets could still win the race with another Zond mission. While Zond would only loop around and not land on the moon, if cosmonauts were to do this, they would become the first pilots to fly to the moon. Subsequent Apollo landings then would appear merely as following in Soviet footsteps. During that same September, Webb announced that he would step down as NASA Administrator. He had held that post since 1961; he now would turn it over to Paine, who would serve as Acting Administrator until the next president, due to be elected in November, could name a new head of NASA. Webb's resignation took effect early in October and left Paine free to make decisions as opposed to only recommendations. What the rebels and dissenters ask will not be found on the moon: social justice, peace, an end to hypocrisy - in short, Utopia. But to the extent that the rebels really want a particular kind of tomorrow - rather than simply a curse on, and an escape from, today - the moon flight of Apollo 8 shows how that Utopian tomorrow could come about. For this is what Westernized man can do. He will not turn into a passive, contemplative being; he will not drop out and turn off; he will not seek stability and inner peace in the quest for nirvana. Western man is Faust, and if he knows anything at all, he knows how to challenge nature, how to dare against dangerous odds and even against reason. He knows how to reach for the moon. Apollo 8 reflected Paine's leadership and initiative, which he had displayed even while Webb still headed NASA. That mission also reflected a characteristic boldness, a willingness to reach for new horizons; this too was part of Paine's approach. He would display such boldness time and again during his tenure, as he pushed his colleagues to think more daring thoughts. In several respects, however, Paine's position was weaker than that of Webb. Webb had served the Truman Administration as director of the Budget Bureau from 1946 to 1949, and as Under Secretary of State from 1949 to 1952. Though Republicans held the White House during the subsequent eight years, Webb's background made him a charter member of the Democrats' shadow government, ready to receive an important sub-cabinet post when they regained the presidency in 1960. Paine had no such background. He held no record of government service, or even of involvement in the space program as a technical manager. In the words of the historian John Logsdon, "he was as new to the ways of Washington as James Webb had been a master of them." Paine had obtained  his initial selection as Deputy Administrator because he had offered himself for appointment to a high-level Washington position, nature unspecified. The head of the Civil Service Commission found Paine's name in a list of executives who had expressed interest in receiving such posts, and passed it on. There was less to this than met the eye, for in no way did Nixon intend to endorse Paine's bold approach to space flight. "He was not committed to space," recalls Hans Mark, director of NASA's Ames Research Center and later an Air Force undersecretary. "Nixon had no real interest in it. He didn't want to be the president that would kill our space program, but he had no personal interest in it at all." a Democrat in a Republican administration. Just to give you an idea of why I think Nixon didn't give a damn about the space program, he didn't go out and look for a strong Administrator. What better way to have a pliant NASA than to have a Democrat sitting there exposed to his people? When Paine was confirmed as Administrator under Nixon, my reaction was, "Oh, my God - nobody is going to pay any attention to us.'" Amid drama near the moon and change in Washington, NASA plugged ahead, as space shuttle studies continued to receive their modest share of attention. As early as October 1966, a meeting in Houston brought together officials from NASA Headquarters, NASA-Marshall, and the Manned Spacecraft Center. They began to plan a joint study of space shuttles to provide logistics for a space station. A month earlier, a joint Air Force-NASA study had concluded that "no single, most desirable vehicle concept could be identified... for satisfying future DoD and NASA objectives. "18 The participants in the Houston meeting hoped to create a united front within NASA. Noting the substantial number of studies already available, Daniel Schnyer, representing the Office of Manned Space Flight, declared that "we have a vast store of knowledge to draw on, and should now be able to get together and decide on an agency concept for the entire logistic system." This meeting was sufficiently noteworthy for Max Akridge, a representative from NASA-Marshall, to describe it as "the beginning of the space shuttle as such. "19 Little came of it; as George Mueller learned when he hosted his symposium in January 1968, various groups and designers were still pursuing their individual approaches. At least NASA-Marshall would now work in tandem with the Manned Spacecraft Center. This joint approach was in the forefront when, in October 1968, managers from these two centers launched a new round of space shuttle studies. Why could NASA not order up a definitive treatment of some particular concept, such as Lockheed's Star-Clipper, and be done with it? NASA needed such studies because there was no way to get such a definitive treatment, at  least not with the modest sums available to underwrite individual studies. Like professors reviewing a graduate student's dissertation, senior managers could always read the report of a particular study and raise new questions, new topics for further examination. Similarly, like grad students who look for jobs wherein they can continue their dissertation research, engineers and managers were eager to carry forward with new design exercises and further analyses. They would continue to do this as long as funding remained available. Initial activity revolved around a formal Request for Proposal, issued October 30. It represented an invitation for interested companies to describe the studies they hoped to conduct. Responses were due by the end of November. In the parlance of the day, the spacecraft under consideration were described anew as Integrated Launch and Reentry Vehicles, with the new studies representing a continuation of work funded by the Air Force under that designation. The study contracts, signed at the end of January 1969, called for all designs to follow a common set of ground rules. The Statement of Work defined the basic mission as the resupply of a space station, in an orbit with 55-degree inclination. Each vehicle was to carry 12 people, as passengers and crew, or a payload of 25,000 pounds. Contractors were also to present variations of their basic designs, to accommodate payloads ranging from 5,000 to 50,000 pounds. Payload bays were to provide cargo volume of at least 3,000 cubic feet; when returning from orbit, these vehicles were to carry at least 2,500 pounds. Designers were to seek to achieve aircraft-like checkout and ease of maintenance, including readiness for rapid launch in as little as 24 hours. North American Aviation (NAA), which now had the name of North American Rockwell after having merged with the firm of Rockwell International, took a contract.. It was to study new, low-cost, expendable  boosters with reusable upper stages. Having ruled out existing expendables such as the Saturn I-B or Titan III-C, NASA welcomed new concepts. Lockheed was told to concentrate its effort on new studies of stage-and-a-half configurations such as the Star-Clipper. The new topics would include use of solid- or liquid-fueled booster stages that would ignite at liftoff. (Here was another glimpse of the future; the final shuttle configuration, three years later, would use such solid boosters.) In addition to this, Lockheed was to develop its own versions of the Triamese concept for comparison with those of General Dynamics (GD). GD focused on two-stage fully-reusable approaches, excluding stage-and-a-half designs. GD's configurations therefore demanded a "flyback first stage," capable of returning to the launch site, and this firm's engineers were to consider unpiloted concepts. The Triamese approach was to remain an important though not predominant focus of effort. At the same time, NASA officials raised a new question: Is there a way to design a flyback first stage that could develop into a Triamese vehicle? McDonnell Douglas, home of the Tip Tank stage-and-a-half concept, was to study it anew. Like Lockheed, this firm was to look at the use of booster stages; in addition to this, its investigators would study fully-reusable concepts. These became central to this company's efforts as the study progressed during 1969. In the light of subsequent events, one notes particularly the strong emphasis on space station logistics. The study requirements placed little weight on contractor concepts that would specialize in carrying automated spacecraft as payloads. Yet there was a reason for this focus on space-station logistics: Tom Paine wanted such a station, and was pushing hard in Washington to win approval to build it. In December 1968, a month after the election, Townes agreed to chair an advisory group that would make recommendations to the new administration on space policy. The group's members included Robert Seamans, who had been NASA's Deputy Administrator. Other members, including Townes, had served on the President's Science Advisory Committee panel that had prepared the 1967 report, The Space Program in the Post-Apollo Period. chart a bold program.... I think our rate of development can be considerably more rapid than presented in the task force report. For example, I believe we can place men on Mars before 1980. At the same time we can develop economical space transportation which will permit extensive exploration of the moon. On the whole, however, the new report was considerably more cautious in tone than the PSAC review of 1967. On NASA's future, Townes' panelists agreed that "we do not recommend a commitment now to a large space  station, extensive development of "low-cost boosters,' or a manned planetary expedition." The panel called for "a new look...at the balance between the manned and unmanned segments of the NASA space program." Tantamount to asserting that the existing program was badly out of balance, the report proposed redress: "an active and successful manned program for several years while at the same time steadily decreasing the level of funding for manned space flight to perhaps $1.25 billion by fiscal 1972." We are against any present commitment to the construction of a large space station.... The "manned space station' concept, proposed as a program for the late 1970s, is on much more doubtful ground. It is much too ambitious to be consistent with the present clear needs for continued exploration of man's usefulness in space. On the other hand, it is not obviously an effective way of continuing to demonstrate for prestige purposes our manned space capability.... It therefore seems premature to make any firm program decisions regarding the proposed manned space station. The unit costs of boosting payloads into space can be substantially reduced, but this requires an increased number of flights, or such an increase coupled with an expensive development program. We do not recommend initiation of such a development. By then Nixon was in the White House and was dealing with the Federal budget. Preparing a budget for a particular fiscal year took time; though elected in 1968 and inaugurated in 1969, the first budget that would be truly Nixon's own would cover FY 1971. At the moment he was dealing with the budget for FY 1970 that would begin in mid-1969. Like other new presidents, Nixon, seeking to contrast his own financial prudence with the spendthrift ways of his predecessor, ordered his department heads to look for ways to make cuts. There is general agreement that our space efforts should continue, although there are notable differences of opinion in regard to specific projects and the amount of annual funding. Learning of this ploy, Paine protested strongly. He disliked the idea that DuBridge and the OST might present him with plans sanctioned by Nixon that he then would have to execute; as he later put it, "You never want one bunch of guys to do the planning and another bunch to carry it out." Nevertheless, Paine's position was quite weak at that moment. He was no more than Acting Administrator, and because he had sent in his resignation, he was merely serving from day to day at Nixon's pleasure, pending appointment of a replacement. I took the very early and the very strong view...that this must recite the fact that NASA would be responsible for setting up the NASA portion of this, that the Air Force and the DoD would be responsible for the military portion of the space program; and that we then review it with other responsible people...to make it reflect a broad Administration-wide consensus. If not the OST and Lee DuBridge, who would direct this interagency study? The answer lay in the original Space Act of 1958 that had created a policymaking  body, the National Aeronautics and Space Council (NASC). Its members included representatives from all federal agencies with an important interest in space: NASA, the DoD, the AEC and the State Department, the latter because the space program required overseas tracking stations and featured cooperation with scientists of other nations. Though by law, the Vice-President chaired this body, it had never done much. The recent Townes panel described it as "not very effective," noting that Nixon might ask Congress to abolish it. On February 13, Nixon issued a new memo confirming this arrangement. DuBridge was to join the STG and provide its staff. Paine would also be a member. 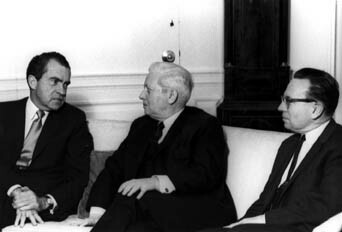 Nixon initially designated Secretary of Defense Melvin Laird as a third member. Laird, however, chose instead to appoint a representative: Robert Seamans, lately the number two man in NASA and now recalled from MIT to become the new Air Force Secretary. The Townes study, the setting-up of the STG, and Paine's attempt to boost his budget all took place between December 1968 and the following March. For Paine, the record was mixed. He sat and watched while Townes' panelists proposed to do little in space that was new. He had lost in his opening encounter with Mayo. He had succeeded, however, in shaping the STG to his liking and had reason to think he would have Agnew as an ally, with Seamans as another highly knowledgeable participant. The second STG meeting was the last such full-dress meeting until August. During the intervening months, participants would call on planning groups to develop specific proposals. Paine was already doing this, for while he might have little clout at the Budget Bureau, on his own turf he was king. He wanted a space station and a great deal more, and was already working with colleagues to determine the designs. Yet though Paine was sounding a clarion call, in a vital respect he was blowing an uncertain trumpet, for his center directors lacked clear direction as to what they were to produce. They were quite ready to boldly go where no one had gone before, but their engineers needed more than 2001: A Space Odyssey when drawing up their specifications. In particular, they needed a well-drawn Statement of Work to direct the new space station studies. Paine, addressing this issue as well, had recently convened a meeting of those directors for this purpose. The draft Statement of Work of that moment was the seventh in a series, and everyone agreed it left much to be desired. Abe Silverstein of NASA-Lewis, who had received Paine's letter of mid-January, cited three criteria in evaluating the draft: "Would contractors receiving this in the mail know what to do? Could we evaluate their responses? Could the project be completed to meet our specs within time and money?" He added that "the number-seven draft document fails to meet these criteria and cannot be edited to meet these criteria. NASA is asking - in mushy language - for something we should know ourselves before going out." He then gave a list of "things we need to do more homework on": size, weight, orbits, programs and experiments, power, logistic support, and communications. "We need to define all these factors for the contractors," he concluded. "In essence, tell them clearly what NASA wants. We need a document that defines the basics." "This work statement doesn't set NASA's sights high enough for the future. We should now be looking at a step more comparable in challenge to that of Apollo after Mercury. The space station size should be modular and based on our Saturn V lift capability into 200-mile orbit. Three launches would give us  one million pounds in orbit, including spent stages. That is the number we should be planning for the core size." Gilruth predicted a need for "nuclear power of several hundred kilowatts. The design should also emphasize the utility of the space base as a way-station to the moon and Mars." This meeting took place late in January. Over the next several weeks Charles Mathews, George Mueller's deputy at the OMSF in Washington, developed new guidelines that now called for two space stations: an initial concept for the short term and a blue-sky version as a follow-on project. However, the latter would show a close relation to the former, for the initial space station would serve as a module or building block. By launching several of them and linking them together in orbit, NASA could assemble a true space base, with accommodation for as many as a 100 people. This brought a highly compelling concept for a space station program that could extend through the 1970s and beyond. The basic space station would not resemble MORL, with its crew of six. Instead, it was to provide room for as many as 12 people. It would have a diameter of 33 feet, compared to the 22 feet of MORL, and would fly on the Saturn V. NASA would resupply this station using the Saturn I-B or the Titan III-M, with the chosen launch vehicle carrying a modified Gemini spacecraft called Big G. The standard Gemini had carried two people; Big G would retain that spacecraft as a cockpit or flight deck, while adding a passenger section with 7 to 10 additional seats. Here indeed was the boldness Paine wanted. Part of what made this scenario exciting was that, in its essence, it called for no more than a modest extension of concepts with which everyone was familiar. The new station would represent something of a stretch when compared with MORL, but its design would rest solidly on the foundation of earlier studies, and it would use the Saturn V. Its logistics vehicle was old hat; the Big G concept had been around since 1967. The space base would evolve from the basic station in a natural way, with a space shuttle - another well-known concept - complementing it strongly. With these plans evolving rapidly, Paine received a request from the White House, dated February 17, in which Nixon solicited his views on issues of policy in space and aeronautics. Paine responded by pouring out his heart in a nine-page letter, again single-spaced. He wanted his space station, naturally, and he not only wanted a presidential commitment; he wanted it quickly. This letter represented an attempt to bypass the deliberations of the Space Task Group, even though Paine was one of its members. It also bypassed the normal budget process. Shuttles would now win new attention, for these studies would feed into the work of the STG. George Mueller then set up a program office almost overnight. To direct it, he picked Leroy Day, an Apollo manager who was two levels down from him on the organization chart. It was April; the Apollo 10 mission was only weeks away, and Day was deeply immersed in preparation for a key pre-launch review. Mueller: I want you to really get going on the space shuttle. We've got a whole series of things to be done. We have to complete reports in about sixty days here, and then we have to negotiate with the DOD. Day: George, what does all this have to do with me? Mueller: Well, this is what I want you to do. Day: But you haven't said anything about me leaving my job in Apollo. You know we're just getting ready for the flight readiness review on Apollo 10. Mueller: I understand all that, but I want you to work on the shuttle. I need somebody to really head up this stuff, and I want you to do it. Day: Well, gee, I guess - let me go back and kind of timeline how I can get disengaged and come back with some dates to you, and then we'll talk about it, and maybe - I guess I can get out in a couple of weeks, right after this flight readiness review. Mueller: No. You don't understand. I want you over here now to begin work on the shuttle. Day: What does "now" mean? Early in May, Mueller hosted a meeting of the NASA Space Shuttle study contractors where he presented them with some new rules. The mission of the Shuttle had emphasized space station logistics, with a modest payload capacity of 25,000 pounds to orbit, 3000 cubic feet, 2500 pounds returned from orbit. This rationale now was broadening to include the launching of spacecraft, many of which would require upper stages to reach high orbits. Mueller told the attendees that "the principal carload capacity that we would have would probably be liquid hydrogen. So that dictates a fairly low density volume." The new rules called for a payload of 50,000 pounds carried both up and down, a volume of 10,000 cubic feet. The payload bay could be 15 or even 22 feet in diameter, the latter accommodating craft that would fit atop an S-IVB. This doubling of the payload weight would bring a doubling in the shuttle's takeoff weight. This would suit the Air Force, which had a strong interest in large payloads and had built the Titan III-C to launch them. Mueller had been a professor of electrical engineering during part of the 1950s. Drawing on this background, he proceeded to lay out a new concept for the use of computers to achieve rapid onboard checkout, and to present flight crews with the information they would use during a mission. This concept would make it possible for a small ground crew to carry out the preflight checks, achieving true aircraft-like simplicity. Mueller called for designers to equip individual shuttle components, such as rocket engines, with sensors that would monitor their condition. Each component would carry a black box that would keep track of measured parameters. At any moment, some parameters would stand within acceptable limits, while others would lie outside such limits. Still other parameters would  be within bounds at that moment, but would be drifting toward unfavorable values. In response to a query from the computer, each black box could answer in turn: "I am well," with all parameters within limits. A particular box might answer, "I am sick," with one or more parameters outside the safe zone. Similarly, a box might respond, "I am about to get sick," with a parameter drifting toward danger. Further queries from the computer then could identify the bad parameters and permit cures. On May 19, two weeks after this meeting, Leroy Day's task group submitted an initial report. It represented a milestone in presenting the Space Shuttle concept as one that might win serious support, for it broadened the rationale while narrowing the range of acceptable design approaches. Since the early 1960s, shuttle advocates had been bedeviled by a multiplicity of reusable launch-vehicle concepts, all of which could claim the name of a shuttle. In their day these had included boosters powered by scramjets or by LACE, horizontal-takeoff vehicles employing a rocket sled, and behemoths such as the Nexus that matched the weight of an ocean liner. These had fallen by the wayside, but the range of concepts had remained uncomfortably broad: expendable boosters with reusable upper stages, stage-and-a-half partially-reusable configurations such as Lockheed's Star-Clipper, two-stage fully-reusables such as General Dynamics's Triamese. This was somewhat like having the Air Force propose to build a new military airplane, without specifying whether it would be a fighter, bomber, or transport. The May 19 report now rejected the use of an expendable booster. To meet Mueller's new requirements, such a launch vehicle would have to be  larger than a Saturn V. It might use a big solid-propellant first stage or rely on low-cost liquid-fueled engines, making it cheaper to buy and fly. This vehicle, however, would splash into the Atlantic every time one of them flew-something that NASA was not about to do. After all, the goal from the start had been to move well beyond the Saturn V, not to develop it anew in a less costly version. In the words of the report, "Fully reusable or near fully reusable systems offer the maximum potential for an economic and versatile space shuttle system." The report also broadened the rationale. To NASA, though not to the Air Force, a shuttle had primarily held the promise of low-cost logistic support for a space station. That made it a speculation nested within a speculation, for the station existed only at the level of designs and dreams. The report now added several attractive types of missions that reflected current practice or that built on current activities in plausible ways. This broadened rationale also made it more likely that NASA could come up with a configuration that would win Air Force support, thus further widening its usefulness. A shuttle might not only place satellites in orbit; it could service them. Standard practice amounted to shooting and hoping, as ground crews launched their rockets and trusted their spacecraft to work. A shuttle crew, however, could check out a satellite after carrying it to orbit, ensuring that it was functioning properly. If a costly spacecraft failed in orbit, a shuttle might fly up to fix it. A shuttle might also carry it to a repair facility within a space station, or return it to earth for rebuilding. This reusable launch vehicle could also be large enough to carry the highly capable Centaur upper stage and powerful enough to carry communications satellites or planetary spacecraft of considerable size. This would lower the cost of such launches, by taking advantage of the shuttle's reusability, without compromising the demands of spacecraft designers by limiting this service to payloads of only modest weight. A shuttle could also serve as an interim space station, by carrying an instrumented and crew-tended module within its payload bay. Such a mission might fly for up to thirty days. It could be far less costly than Skylab, while offering duration, internal volume, and onboard power considerably beyond that of Apollo. Within the STG, Paine represented NASA, Seamans represented the DoD, and DuBridge spoke for the scientific community. Though these leaders and their constituencies held distinctly different views on the future of space flight, the STG would have to reach a consensus if it was to speak with one voice. Much of the work of the STG took place outside its infrequent formal meetings, as these members commissioned studies that would define their positions. NASA already had a well-established planning procedure in place; Homer Newell, the Associate Administrator, had set it up the previous year to develop program options that the Administrator could present to the BoB. This procedure featured a dozen working groups that drew broadly on specialists serving the entire range of NASA activities, with one committee providing coordination and a second committee - the Planning Steering Group - choosing the options that would reach Paine's desk. Newell took on the task of using this machinery to prepare the planning document that Paine would take to the STG. 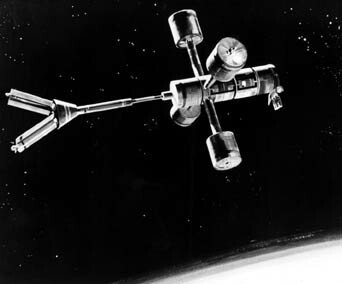 Spurred on by Paine's desire for boldness, Newell's planners proceeded to develop a scenario calling for a fast-paced effort that would emphasize space stations. The program called for an initial station in 1975, with a crew of 12, followed quickly by additional stations in polar orbit and in geosynchronous orbit, the latter at an altitude of 22,300 miles. A space shuttle would enter service during 1977. At the same time, other stations would be operating in lunar orbit and on the moon's surface, while NASA would begin to build an earth-orbiting space base for a crew of 50. Though Mueller also was interested in Mars, he disliked the overall approach of Newell's planning. In sowing the earth-moon system thickly with space stations, Newell was repeating the basic theme of the ambitious Apollo Applications wish list of a few years earlier. Mueller knew from sad experience that this would not work. He had tried it, and all he had produced was was the Skylab. Newell's approach smacked of building space stations for their own sake, as if NASA was the Bureau of Reclamation with its penchant for dams and water projects. The stations also failed to point a clear path toward Mars. Mueller, working with the planners at Bellcomm, was devising both an integrated program and an integrated set of projects that could carry it out. This plan resembled Leroy Day's for the shuttle. Day's plan held a space base as a long-term goal but asserted that the shuttle would pay its way in the nearer future by launching and servicing payloads. Similarly, while Mueller and Bellcomm aimed specifically at Mars, they expected to get there by using rockets and spacecraft that would serve a broad range of activities between the earth and the moon. The key was breadth of application. A version of the plan presented to STAC that July stated that "the program of developments and flight activities that comprise the integrated space program will expand this nation's capacity for space flight as far as foreseeable development in technology will permit." Space Tug: This would serve as a general-purpose vehicle that would be based in space, returning to earth only at rare intervals, if at all. It would draw on the ability of the shuttle to carry propellants in substantial quantities. The tug would operate as a "utility propulsion module capable of transporting men, spacecraft and equipment throughout cislunar space." It also would provide a ferry from a lunar-orbiting space station to the moon's surface. Astronaut-Tended Spacecraft: These would include large automated telescopes in orbit as well as automated applications satellites. They would be designed to take advantage of the shuttle's capacity for revisit and on-orbit maintenance, including the installation of upgraded instruments by the flight crews. .....shuttle both based in space. In turn, this system would serve an array of programs that would focus on applications of a space station module. Variants of this module would operate as components of a large space base, as stations in lunar orbit and on the moon's surface, and as a geosynchronous station. Mueller's integrated plan came along a little too late to serve as the basis for a July draft of NASA's report to the STG, setting forth the agency's proposals. That draft drew principally on Newell's work, adding a discussion of Mueller's plan as nothing more than an appendix. Within a week, however, the appendix became the core of the report. The reason for this, as one might expect, was Tom Paine. Newell's Planning Steering Group (PSG) had briefed Paine on its activities at the end of May. A dissatisfied Paine saw the report as tantamount to stapling together the contributions of its task groups, for the PSG at that moment had nothing so succinct as a clear emphasis on space stations. Paine was not pleased "with the level of imagination and the level of innovation and the level of forward thrust"; he described the recommendations as "good, workmanlike, but stodgy and unimaginative." Yet while Mueller's plan offered exciting theater, it flew in the face of the demand by the Townes panel for redress of the imbalance between the piloted and automated elements of NASA's program. These corresponded respectively to OMSF and OSSA. With Newell having come out of OSSA to direct his NASA-wide planning activity, there had been at least a chance that NASA might respond to Townes' call. When Mueller, head of OMSF, took over the planning with a set of proposals that grew out of his ties to Bellcomm and STAC, it was clear that Paine would go to the STG with an agenda that would be virtually all OMSF. Paine then would learn that there were plenty of people, in both the Air Force and in the scientific community, who opposed a  single-minded emphasis on piloted flight, and who certainly were in no hurry to get to Mars. I recommend that we embark on a program to study by experimental means including orbital tests the possibility of a Space Transportation System that would permit the cost per pound in orbit to be reduced by a substantial factor (10 or more). Even though the development of a large manned space station appears to be a logical step leading to further use and understanding of the space environment, I do not believe we should commit ourselves to the development of such a space station at this time. Lee DuBridge, the third member of the STG, developed his own view as well. As chairman of the President's Science Advisory Committee (PSAC), he commissioned a report from the PSAC's Space Science and Technology Panel. He also issued invitations to other institutions to present their own positions. The respondees included the American Institute of Aeronautics and Astronautics (AIAA), the nation's principal professional society in this field. The AIAA might readily have done the expected by acting as a standard Washington lobby, pleasing its corporate members by asking for the moon. It did no such thing; it issued a report that was remarkable for its moderation. Flight to Mars? "This program is the next major step after unmanned exploration of the planets. While it is technically possible to commit to development of vehicles for this program at this time, it would not be reasonable to do so." Space stations? "Again, there has been a constant flow of studies for 10 years of small and large space stations, most of which assumed that man was to find an abundance of tasks to perform continually in space." The AIAA declined to endorse any such proposals, opting instead for additional activity within Apollo Applications. Its report noted that such missions "will provide a means of retaining a manned orbital capability until flight experience produces desirable specifications for new orbital-station hardware." One of a number of papers that reached the PSAC, the AIAA report's moderate tone gave it weight. The PSAC also gave attention to Russell Drew, a staffer at the Office of Science and Technology. Drew became convinced that the Shuttle was the key element in the long-range program. In May, the PSAC's Space Science and Technology Panel met with the full PSAC at Cape Canaveral, with the Space Shuttle as a prime topic of discussion. Drew wrote a background paper that emphasized its use in launching automated spacecraft. Significantly, he downplayed its uses in supporting a space station. The PSAC report made recommendations that closely resembled those of Seamans. Seamans had proposed an expansion of Apollo Applications; the PSAC did so as well, asserting that such a program could provide much of the data on long-duration human space flight "for which a more ambitious space station has been proposed." PSAC rejected such a station, and proposed merely to "keep open the option of manned planetary exploration in the 1980's, but without immediate commitment to this goal." It is worth noting that PSAC, AIAA, NASA, and the Air Force all endorsed a shuttle. NASA had developed this concept for use in space station logistics, but the other three institutions rejected such a station out of hand. Nevertheless, they liked the Shuttle because it seemed to promise lower cost and greater effectiveness in supporting automated spacecraft. This unanimity gave critical political support to NASA during 1970 and afterward. In their overall views, however, the members of the STG were badly split. There was good agreement between the views of Seamans and of DuBridge, but Paine was far out in the blue sky. This raised the possibility that DuBridge and Seamans might collaborate on a majority report, leaving Paine to tack on his views as an appendix, as Francis Clauser had done with his letter to the Townes panel. The STG, however, had a fourth member: its chairman, Spiro Agnew who had been developing his own views as well. Like many other children of immigrants, Agnew had advanced in the world largely through his own talent and effort. On the eve of World War II, he had been a claims adjuster for the Lumbermen's Mutual Casualty Company in Baltimore. After returning from service in the Tenth Armored Division, he became a manager at Schreiber Food Stores. He acquired a law degree and launched his political career by winning the presidency of his local PTA. He rose in politics through the next 20 years, and ran for governor of Maryland in 1966. It was a time of racial upheaval, and his Democratic opponent courted the votes of white people with thinly-disguised racial appeals. Agnew built a reputation as a moderate, won support among black voters, and took the election. He maintained his role as a political moderate, becoming a leading supporter of Nelson Rockefeller, governor of New York, who competed with Nixon for the 1968 GOP presidential nomination. Nixon picked him as his  running mate largely because he had not been around long enough to draw opposition from any of the party's factions. Agnew himself admitted that his name was "not a household word." This insensitivity was part of a larger artlessness, for in dealing with the space program he quickly showed that despite having no background in this area, he would rush in where leaders such as Robert Seamans and Lee DuBridge would fear to tread. At Cape Canaveral, six weeks after the inauguration, he stated at a luncheon that he was "all-out for space." Less than three weeks later, at a meeting of the STG, he suggested that Mars could be an Apollo-like goal for the 1970s. He then raised the prospect of Mars repeatedly in subsequent discussions. In mid-May, the STG met with members of the House and Senate who served on the congressional space committee. In the words of an observer from the Budget Bureau, "a promotional motive...ran virtually unchecked" at the meeting. Agnew declared that the nation could "prove its greatness" with the space program. He added that he "might be all alone," but he "favored a great achievement represented by planetary travel as a way of invigorating the American public." Early in July, at a meeting with space planners from outside the government, he stated that "a manned spaceflight to Mars" could be the "overture to a new era of civilization." He compared this mission to the early voyages of exploration: "Would we want to answer through eternity for turning back a Columbus or a Magellan? Would we be denying the people of the world the enlightenment and evolution which accompany every great age of discovery?" Thus far he had restricted his comments to audiences at STG meetings. On July 16, however, as he joined thousands of people at Cape Canaveral for  the liftoff of Apollo 11, he went public. He stated in an interview that he had the "individual feeling that we should articulate a simple, ambitious, optimistic goal of a manned flight to Mars by the end of this century." This statement brought quick reaction within NASA, as Paine directed his planners to come up with a "very strong, very far-out, but down-to-earth presentation" that would "substantially shake up the STG." Specifically, these planners were to prepare a proposal for a Mars mission at a date well before 1986, a date that Mueller and Newell had previously endorsed in their planning. Mueller's planners at Bellcomm, who had already devised a concept for a Mars mission based on Mueller's integrated plan, briefed Paine on their scenario on July 19. Characteristically, Paine wanted more, and decided to "wheel up NASA's big gun": Wernher von Braun. He told Von Braun to prepare a presentation for the STG on the feasibility of a Mars mission that would resemble Bellcomm's, but that would fly at the earliest possible date. As the Apollo astronauts flew over the moon's gray surface on Christmas Eve, they spoke to us of the beauty of earth - and in that voice so clear across the lunar distance, we heard them invoke God's blessing on its goodness. Amid the glow of that triumph, Paine had tried to win a budget increase and to gain Nixon's support for a space station. Now in July, the Apollo 11 lunar landing encouraged even more far-reaching thoughts. In addition to this, the success of Apollo 11 had the highly practical consequence of freeing up the first Saturn V for other duty, as Paine committed one of them to launch the Skylab dry workshop.65 Such broadened use of the Saturn V would be a keystone of an effort that would aim at Mars. The members of the STG - Paine, DuBridge, Seamans, and Agnew - had not held a full-dress meeting since March, for their staffs had been busy preparing proposals and working papers. On August 4, however, two weeks after the moon landing, these principals met anew. Paine declared that "Apollo 11 started a movement that will never end, a new outward movement in which man will go to the planets, first to explore, and then to occupy and  utilize them." He then turned the meeting over to Von Braun, who proceeded to describe a "typical manned Mars mission." Carrying 12 astronauts, it would leave Earth orbit in two spaceships on November 12, 1981. It would arrive in Mars orbit on August 9, 1982 and would spend 80 days in this orbit, with six crew members descending to the Martian surface and spending up to two months exploring it. The expedition would leave Mars late in October and would swing past Venus four months later. It would arrive back in Earth orbit on August 14, 1983, ending a flight of 640 days. This proposal left the STG split right down the middle: Agnew and Paine supporting a strong push toward Mars, DuBridge and Seamans recommending much less. There was a fifth man at that meeting: Robert Mayo, director of the Budget Bureau. Though he was an observer rather than a full member of the STG, his views would carry weight. His staff had been considering proposals as well. They emphasized the need not for a single program, but for alternative programs with budgets at different levels. Mayo now found an ally in Seamans, who had been highly skeptical of Paine's ambitious plans. 1. "Austere": Level funding at $4 billion per year, with no commitment to Mars but with an option for such a mission retained. 2. "Intermediate": Funding increasing over the next five years to $5-6 billion per year, with a commitment to Mars. This commitment would carry no fixed date, but the mission would probably fly in the mid- to late-1980s. This was a major victory for Paine. This three-option package again reflected standard practice, with the one in the middle as the one for the President to choose. The other two choices then would appear as too much and too little. The STG's "intermediate" program specifically envisioned a commitment to Mars, with all that would entail: a space shuttle, space station, space tug, and nuclear shuttle. The only questions would involve the pace, schedule, and budget. Paine, quickly following up this victory with another, won the assignment of preparing the details of the three options. This played to a long-established art whereby the officials chosen to write a White House report can often shape it to suit their preferences. Rather than provide three different programs, Paine's staffers proceeded to develop three different schedules for the same plan. That plan took Mueller's integrated scenario as its point of departure, with all three aiming at a piloted Mars mission sometime during the 1980s. Significantly, amid the deliberations of the STG, the members with the most experience - Seamans and DuBridge - favored the most modest initiatives. Paine, the man for Mars, had held his posts within NASA for barely a year and a half. Agnew, most enthusiastic of all, had never dealt with space at any serious level; he hardly knew a rocket from a sprocket. The nation had changed since 1961. The circumstances that had led to Apollo no longer applied. America now faced new issues and new concerns to such a degree as to make even the moon landing appear merely as an irrelevant distraction. In no way would Nixon endorse a mission to Mars. Indeed, within this new climate, even Plan D would prove to be out of reach. 1. NASA SP-4012, Vol. II, pp. 487-488. 2. Astronautics, December 1962, pp. 32-35; Astronautics & Aeronautics, May 1968, pp. 44, 45; Halliday and Resnick, Physics, pp. 516-519. 3. Astronautics & Aeronautics, June 1965, p. 42; NASA SP-4012, Vol. II, pp. 478-480, 484-485. 4. AAS History Series, Vol. 12, pp. 109-124; Astronautics & Aeronautics, June 1965, pp. 34-35, 42-46. 5. Astronautics & Aeronautics, May 1968, pp. 42-53; NASA SP-4012, Vol. II, pp. 487-488. 6. Logsdon, Apollo, Chapter 2, pp. 7-10; NASA SP-4102, pp. 256-257. 7. Memo, Homer Newell to George Low, February 9, 1970. 8. John Mauer interview, Willis Shapley, October 26, 1984, pp. 8-9. 9. Budget Bureau, "National Aeronautics and Space Administration - Highlights Summary," October 30, 1968. Reprinted in NASA SP-4407, Volume I, pp. 495-499. 10. NASA SP-4102, p. 188. 11. Ibid., pp. 309, 310; Logsdon, Apollo, p. I-14. 12. Biographical data, Thomas O. Paine papers, Library of Congress. These papers include an example of a submarine sketch. 13. This happened during the Apollo 13 mission, in April 1970. 14. NASA SP-4205, pp. 256-260; Logsdon, Apollo, Chapter 2, pp. 10-14; Levine, Future, pp. 101-102; Chaikin, Man, pp. 56-59; Heppenheimer, Countdown, pp. 237-239, 243-244; NASA SP-4102, pp. 257-258, 311. 15. Time, January 3, 1969, p. 17. 16. NASA SP-4102, p. 309; Logsdon, Apollo, pp. I-14, II-12, III-2. 17. John Mauer interview, Willis Shapley, October 26, 1984, p. 7; interview, Hans Mark, Austin, Texas, October 16, 1991, pp. 9-10. 18. Ames, chairman, Report, p. 1. 19. Akridge, Space Shuttle, pp. 25-26. 21. Ibid., pp. 46-53, 55-57. 22. Logsdon, Apollo, p. 1-16. 23. Ibid., p. I-23; Long, chairman, Space Program, p. v; Astronautics & Aeronautics, May 1969, p. 35; Townes, chairman, Report, letter attached. Reprinted in NASA SP-4407, Vol. I, p. 512. 24. Townes, chairman, Report. In NASA SP-4407, Vol. I, pp. 499-512. 25. Letter, Paine to DuBridge, May 6, 1969. 26. Logsdon, Apollo, Chapter 3, pp. 2-3; letter, Paine to Mayo, February 24, 1969. 27. Memo, Mayo to Nixon, March 3, 1969; letter, Mayo to Paine, March 3, 1969. Quoted in Logsdon, Apollo, p. III-7. 28. Logsdon, Apollo, p. III-10. 29. Ibid., p. II-23; NASA SP-4102, p. 15. 30. Townes, chairman, Report, pp. 22-28. Reprinted in NASA SP-4407, Vol. I, pp. 509-511. 31. Memo, Nixon to DuBridge, February 4, 1969. 32. Logsdon, Apollo, p. IV-4. 33. Interview, Thomas Paine, September 3, 1970, pp. 5-6. 34. Ibid., p. 7; NASA SP-4102, p. 15; Townes, chairman, Report, pp. 7, 27. Reprinted in NASA SP-4407, Vol. I, pp. 502, 511. 35. Logsdon, Apollo, Chapter 4, pp. 5-7; memo, Nixon to Agnew et al., February 13, 1969. Reprinted in NASA SP-4407, Vol. I, pp. 512-513. 36. Thompson, ed., Space Log, Vol. 27 (1991), p. 107; "Visit by the Vice President, Kennedy Space Center," March 3, 1969. Thomas Paine papers, Library of Congress. 37. Logsdon, Apollo, Chapter 4, pp. 8, 9. 38. Aviation Week, October 21, 1968, pp. 25, 26. 39. Letter, Paine to Silverstein, January 14, 1969. 40. Paine, speech, February 11, 1969. 41. Paine, notes, January 27, 1969. 42. Aviation Week: June 19, 1967, pp. 20-21; February 24, 1969, pp. 16-17; Report H321 (McDonnell Douglas); Logsdon, Apollo, Chapter 3, pp. 23-24. 43. Memo, Paine to Nixon, February 26, 1969. Reprinted in NASA SP-4407, Vol. I, pp. 513-519. 44. Memo, Nixon to Paine, March 7, 1969; Logsdon, Apollo, p. III-8. 45. Logsdon, Apollo, Chapter 3, pp. 24-26. 46. Aviation Week, February 10, 1969, p. 17. 47. John Mauer interview, Leroy Day, October 17, 1983, pp. 1-3. 48. Ames, chairman, Report, p. 1; Logsdon, Apollo, p. IV-9; "Terms of Reference for Joint NASA/DOD Study of Space Transportation Systems," April 11, 1969. Reprinted in NASA SP-4407, Vol. II, pp. 364-365. 49. Mueller, Briefing, 5 May 1969. 50. Day, manager, Summary Report, May 19, 1969. 51. NASA SP-4102, pp. 256-257; Logsdon, Apollo, Chapter 4, pp. 17-19, 26-27. 52. NASA SP-196, pp. iii, 5, 12; Logsdon, Apollo, Chapter 4, pp. 16-17, 18, 26. 53. Logsdon, Apollo, Chapter 4, pp. 27-28. 54. Ibid., pp. 19-20, 23-24, 48. 55. Ibid., pp. 25-26, 27, 30-32, 48-49. 56. Ibid., pp. 22-25, 32-33; interview, Thomas Paine, September 3, 1970, p. 3. 57. Letter, Seamans to Agnew, August 4, 1969. Reprinted in NASA SP-4407, Vol. I, pp. 519-522. 58. Astronautics & Aeronautics, July 1969, pp. 39-46. 59. Logsdon, Apollo, Chapter 4, pp. 33-38; DuBridge, chairman, Post-Apollo. 60. Manchester, Glory; White, 1968; see index references. 61. Logsdon, Apollo, Chapter 4, pp. 12-13, 39-40. 62. Ibid., pp. 40-43, 48-50; interview, Thomas Paine, September 3, 1970, pp. 9-10; John Logsdon interview, Wernher von Braun, pp. 11, 13. 63. Interview, Thomas Paine, September 3, 1970, p. 11. 64. Nixon, Inaugural Address, January 20, 1969. 65. NASA SP-4208, pp. 109-110. 66. Logsdon, Apollo, Chapter 4, pp. 51-52. 67. Ibid., pp. 55-60; John Logsdon interview, Robert Seamans, Washington, September 2, 1970, p. 13. 68. Logsdon, Apollo, Chapter 4, pp. 60-63; Newell, chairman, America's Next Decades, pp. 59-60.